We instigated the Harmonic Mixing revolution and have shown millions of DJs how to use this powerful technique. In this guide, we’ll show you how world-famous DJs like David Guetta use Mixed in Key software for harmonic mixing. Whether blending whole tracks, samples, vocals, melodies or basslines, Harmonic Mixing will help you sound amazing. This simple technique unlocks a treasure chest of creative possibilities. You’ll have the key to flawless mixes, impeccable mash-ups and learn how to control the energy of your set in a myriad of new ways. The best Key Detection software. Period. We’ve been developing this software for over a decade, and independent tests consistently show Mixed In Key to be the most accurate key detection system on the planet. These days, most DJ software comes with an in-built, inferior system of its own, yet Mixed In Key remains the ultimate choice for the world’s top DJs. We’re the original and best key detection software available. Doesn’t my DJ software come with Mixed In Key? In a word, no. 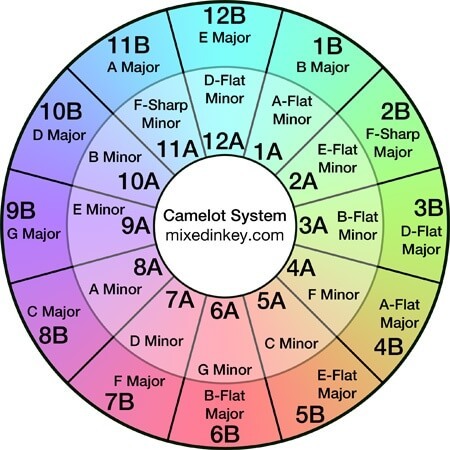 Some DJ software uses our Camelot system, but you will only find the accuracy and peace of mind that comes from our Mixed In Key algorithm by downloading our software direct. Mixed In Key will instantly feed your results to your DJ software, giving you the most accurate key information possible and ensuring your mixes are spot on. This is the Camelot Wheel. Each musical key is represented by a number and letter combination. The outer ring has Major Chords, while the inner ring shows Minor Chords. Our Camelot Easymix system makes navigating through keys as easy as counting up and down. Key matching matters because it makes the music sounds like it belongs together. You could, therefore, stick to the same key for your whole set and everything would sound ‘correct’. But after a while it would get pretty boring. Liven things up by moving around the Camelot Wheel – go up or down one increment in a straight line on the wheel and you’ll sound great. 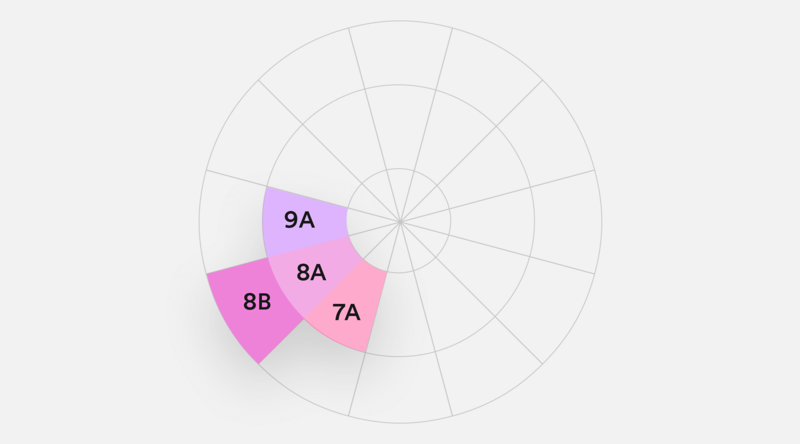 Check it out: 8A goes to 9A or 7A, because they’re one number up/down on the wheel, in a straight line from 8A. For a pleasant harmonic mix, you can keep the same number, but change the letter. For example, 8A goes with 8B because the number 8 is the same. You can mix between them. That gives you four great options. If you’re looking at your Mixed In Key results and trying to decide what song to play next, look for something that’s adjacent to your current Key Code. All of those songs will be harmonically compatible. So you’ve nailed the basics – you can mix up and down on the Camelot wheel and are loving the results. But don’t be fooled, there’s more to it than meets the eye. Try plotting your way clockwise or anti-clockwise around the wheel… nice, right? Moving in this kind of sequence keeps your set sounding harmonically pleasant, fresh and dynamic. You can even go wild and drop in occasional curveballs. Some top DJs will grab their audience’s attention with a crazy move like slamming a mix from a 3A track to a 9A track. It sounds pretty brazen, and should be used with extreme caution, but goes to show how creative you can get when you master Harmonic Mixing! OK, this is extreme, but a great example of what can be done when you unlock the power of Harmonic Mixing. 32 tracks, 6 minutes, zero key clashes! Download Mixed In Key today and start your Harmonic Mixing journey. Everything in this mini-DJ set is harmonic, which means there are no key clashes. You can do the same thing with your favorite DJ software – just analyze your tracks with Mixed In Key and create a playlist that sounds amazing to you. Not only do famous DJs use Harmonic Mixing to ensure tonal perfection, they are also adept at manipulating their audience with track selections that have the ideal Energy Level. Mixed In Key makes it super easy for you to understand your collection’s potential by rating every track with an Energy Level from 1-10. It’s an awesome way of ensuring you pick the perfect track for that hands-in-the-air moment, set finale or super smooth warm-up vibe. Harmonic Mixing combined with Energy Level ranked selection is the secret trick of the professionals. Only Mixed In Key can give you that professional know-how at the touch of a button. Watch out for Jaws! We analyzed Armin Van Buuren’s DJ set with Mixed In Key software and shared our thoughts on what makes him an incredible DJ and an inspiration. We analyzed Diplo’s DJ set with Mixed In Key software. These are our thoughts on what makes him an incredible DJ and an inspiration.